GME has focused attention on the rediscovery of lesser known movies in the Film Noir genre. 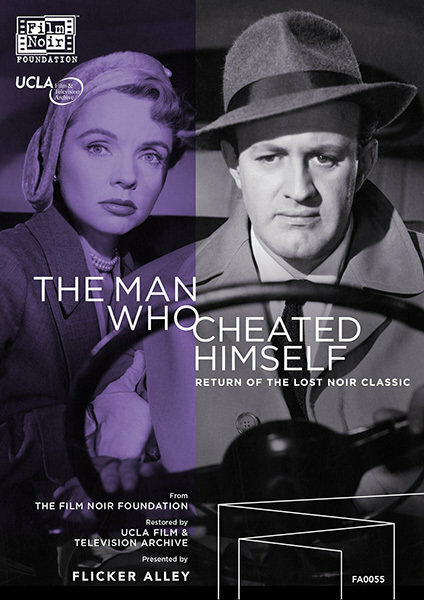 In addition to our prior release of TOO LATE FOR TEARS (1949) and WOMAN ON THE RUN (1950), we are now pleased to offer the newest DVD publication in conjunction with Flicker Alley, THE MAN WHO CHEATED HIMSELF (1950). In the hard-boiled Film Noir tradition, reminiscent of the work of James M. Cain, greed, unstoppable sexual attraction, and betrayal set off a doomed course in which a femme fatale leads a once upstanding citizen down a dark path. Blinded by love, homicide lieutenant Ed Cullen (Lee J. Cobb, fresh off originating the role of Willy Loman on Broadway in  DEATH OF A SALESMAN) goes to great lengths to cover up a murder. His coquettish girlfriend Lois (Jane Wyatt, best known as the mother in the television series FATHER KNOWS BEST) has killed her scheming husband before he could bump her off. John Dall (GUN CRAZY) co-stars as Ed’s kid brother Andy, a rookie on the force who is determined to break his first big case. These accomplished actors are nearly eclipsed by the incandescent star power of San Francisco and especially the world’s most photographed bridge, the Golden Gate. (See also WOMAN ON THE RUN, another Film Noir shot on location in San Francisco). THE MAN WHO CHEATED HIMSELF (1950) was the first independent production of Phoenix Films, the company run by Jack M. Warner, son of Warner Bros. Studios mogul Jack L., and a highlight in the lengthy career of director Felix E. Feist. He helmed more than 45 shorts and feature films between 1932 and 1953, and then, between 1953 and 1965, both produced and directed episodes from various television series, including BONANZA, BUS STOP, THE OUTER LIMITS, PEYTON PLACE, and THE O.HENRY PLAYHOUSE.